Inside the Charles Simonyi Space Gallery at the Museum of Flight in Seattle is a Full Fuselage Trainer Shuttle. This is the same trainer shuttle that NASA astronauts use to prepare for missions in space. In addition to adopting this historic shuttle, the Museum of Flight sent out a RFP to various interactive design agencies to pitch on a new installation focused entirely on space exploration. 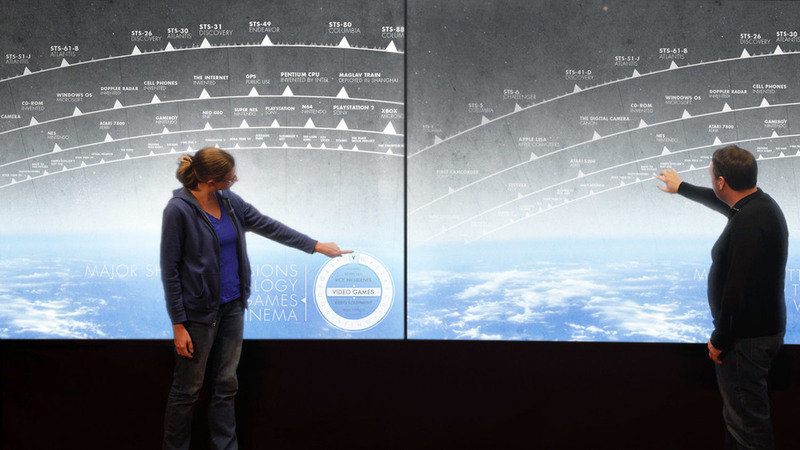 These installation concepts were designed to be displayed in a large-scale format, on a touch-enabled screen large enough for multiple visitors to enjoy simultaneously. One part of the design challenge was to create compelling interactions beyond the standard fare museum experience, something closer to the intersection of education and entertainment. Conceptual designs for a large-scale public installation at the Museum of Flight.